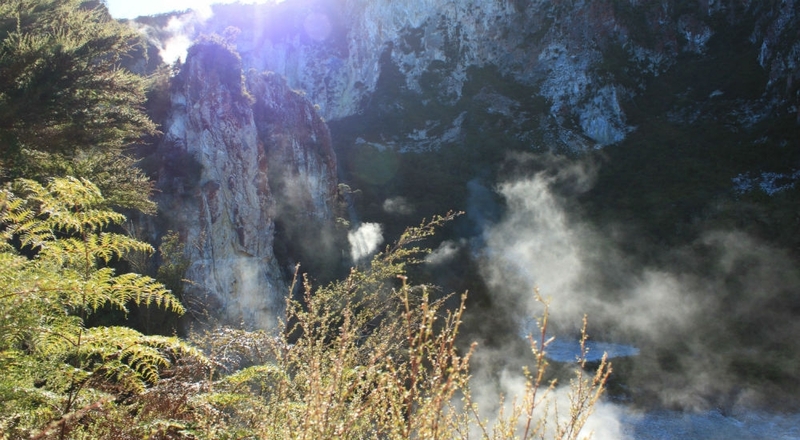 Rotorua and its surrounding areas offer interesting and beautiful walks complemented by the unique landscape and geothermal activity. 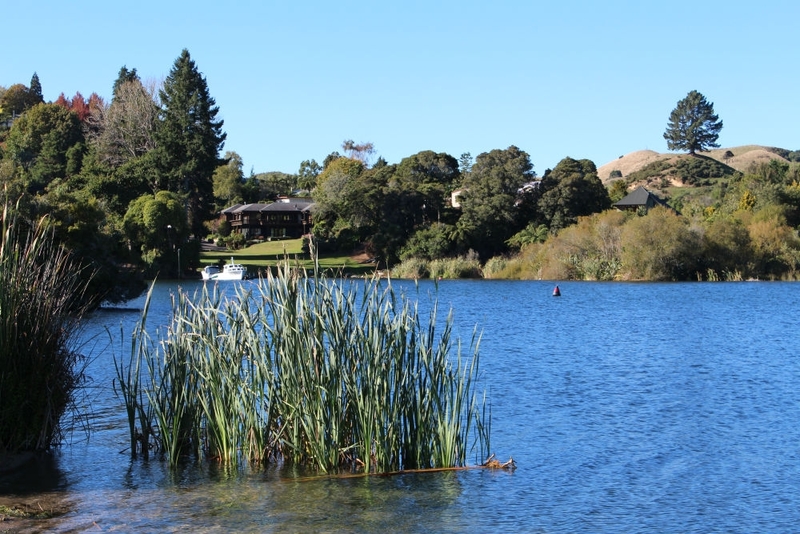 Rotorua walks means seeing lush native bush, ancient forests, cascading waterfalls, volcanic craters and some of the clearest, freshest water you have ever seen in your life. 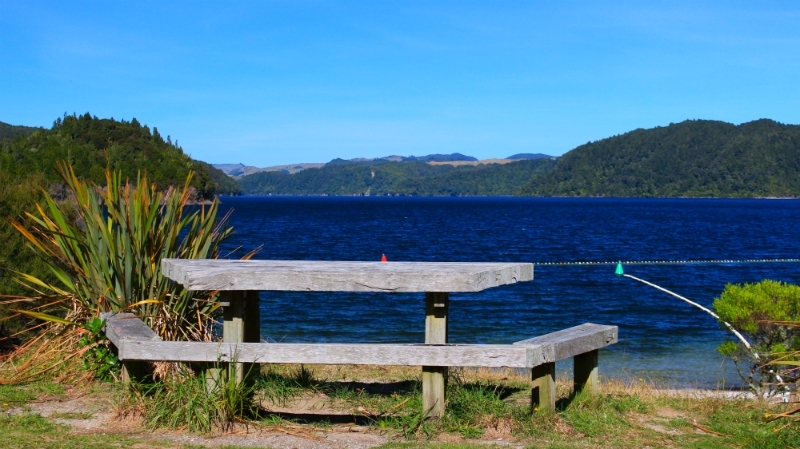 Here's our pick of the best short walks in Rotorua. The unique geothermal vegetation and landscape provides a dramatic backdrop of orange, red and brown steaming cliffs. It's a short walk to a viewing platform that overlooks emerald coloured crater lakes and the steaming face of Rainbow Mountain. There is also the option of continuing up to the summit on the 2.5 kilometre walk. It's a steep climb in parts and typically takes between 1 to 1.5 hours to reach the top. You can read more details in our article on the Rainbow Mountain Summit Walk. Start/Finish: 26km south-east of Rotorua just off SH5. 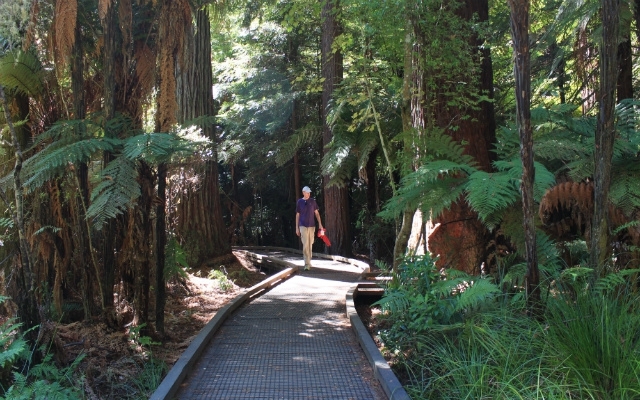 This is an easy and scenic walking track taking you alongside a stream and through a grove of Redwood trees. You can view the beautiful, crystal clear springs from an elevated platform. The surrounding area is a wildlife sanctuary, so keep your eyes open for herons, black teal and the endangered dabchick. Start/Finish: Drive for 15 minutes north-east from the centre of Rotorua. The springs are on the left-hand side of Hamurana Road. This scenic bushwalk has lookouts to Okere River but most impressive are the spectacular Okere Falls. The interpretative panels dotted along the way give information about the landscape and history of the area. Watch kayakers and rafters course they way down the waterfall – the highest commercially rafted in the world. Start/Finish: 21km from Rotorua on Trout Pool Road. A great short walk in Whakarewarewa Forest to take visiting friends and family and at the same time tick off a popular attraction. This easy walk meanders through towering Californian Redwoods that were planted way back in 1901. The loop walk starts/returns at the visitor centre and offers a great way to get up close to the 219 feet high trees and see a diverse range of native plants and birds. Along the way you'll also pass over a boardwalk that traverses the old thermal pond and home to a variety of exotic aquatic plant life. This walk is a longer walk in Whakarewarewa Forest but still nice and easy. After a stroll through the Redwoods, the track leads into a short climb through mature Douglas fir, Walnut, European Larch, and various species of Eucalypts. 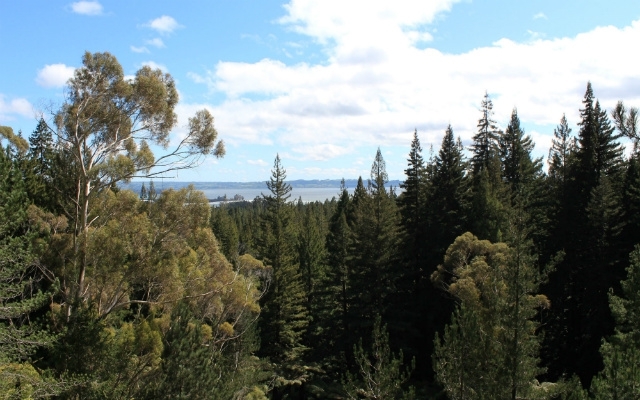 The Old Quarry lookout point offers a great view over the Redwood Grove and beyond to Lake Rotorua and the city centre. You'll then descend the steps into the Quarry basin and can follow Quarry Road back down to the Redwoods car park for a shorter walk of an hour or, follow the green arrows to continue for the full 90 minute walk. This circular loop is fairly gentle and even - great for families and school groups. Close to town, this track showcases the beautiful flora and fauna of Mt Ngongotaha. A highlight is one of the largest rata trees in the Bay of Plenty seen from a viewing platform. Start/Finish: Start at the Violet Bonnington Reserve, 15 minutes from Rotorua. Encompassing the nature loop and rata tree, the extension onto the Jubilee gives those who are looking for a steeper ascent the challenge they are looking for. Once you reach Mountain Road it is a short climb to the summit. Start/Finish: Violet Bonnington Reserve, 15 minute from Rotorua city centre. Mostly easy with some steeper variations, this boardwalk weaves through wetlands and areas of regeneration. There are some small waterfalls set among the native bush and an abundance of trout. 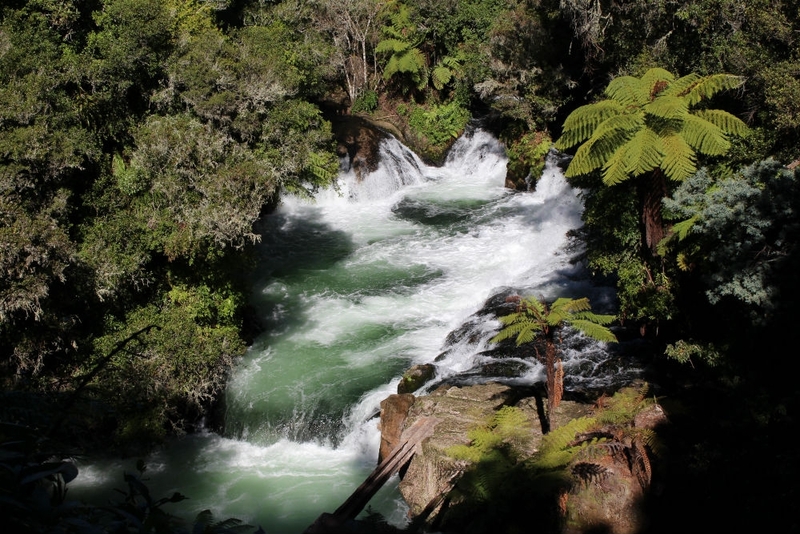 The Waihou River is fed by springs and it is startlingly clear with a chalky blue hue. Start/Finish: Drive west from Rotorua on SH5 towards Tirau. Take the Putaruru turning. Mountain bikers and walkers can both enjoy this dual-use track. It begins at Tawa, the highest point in Whakarewarewa Forest at 765 metres. 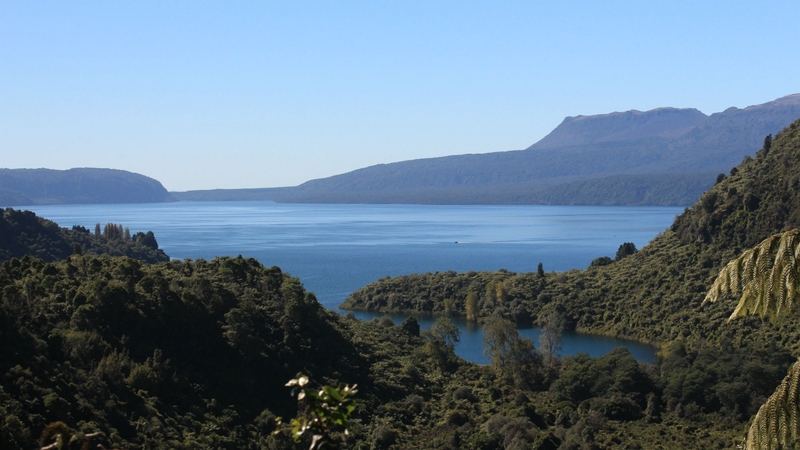 The trail is named after the respected Tuhourangi tohunga who predicted the Mt Tarawera eruption. Start/Finish: Take the SH5 from Rotorua and head south. The entrance to the forest is 1km outside of the city. Part of the Mokaihaha Ecological Area, walkers will hear the calls of bellbirds, tui, fantails and kereru. Kaka (native parrots) are also common to the area and regularly entertain walkers. 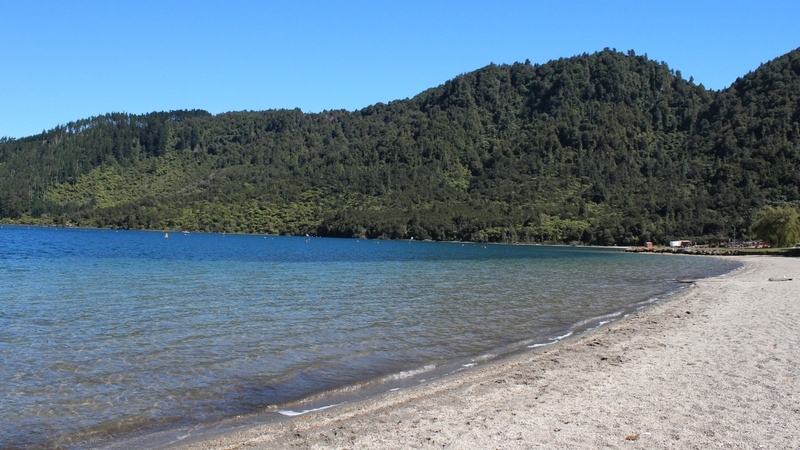 You will hike through extensive native forest and view Lake Rotohokahoka. Start/Finish: 9.6km south-east of Mamaku Township. The track crosses Ohaupara Stream several times before eventually climbing to a ridge. You will take the left fork and descend for one hour to a stream, You will then climb for a further one and a half hours to Mangorewa Stream. Start/Finish: Take SH36 north from Rotorua for 20km and look out for the Mangorewa Ecological Area.